Arika Kane is an extraordinary Singer, artist and songwriter who has worked with some of the industry’s best. Her love for singing began at an early age. She released a self-entitled album “Arika Kane”, “Let Go”and another album “Substance”. Arika Kane’s albums along with her single “No More” was on Amazon’s top 10 bestsellers list for 14 weeks in 2013. 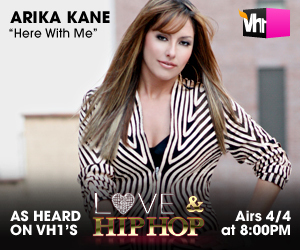 You have heard her music on VH1 series such as Love and Hip Hop, What Chili Wants, Single Ladies and Hollywood Exes. She just released her new single “It’s There” featuring the talented and legendary singer Brian McKnight. The song “It’s There” talks about the ups and down of love and getting through the hard times. Check out the video below.